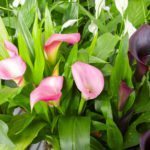 My gorgeous calla has been in blossom for 2-1/2 weeks. The flower stems are bending and the flowers are wilting. The plant is in the southern window (indoors). HELP!